[prMac.com] Waterloo, Ontario - SuperMegaUltraGroovy and toastycode today announced the immediate availability of TapeDeck 1.1, a free update to the popular recording application for Mac OS X 10.5 Leopard. The new features in TapeDeck 1.1 make it easier to share tapes with others. 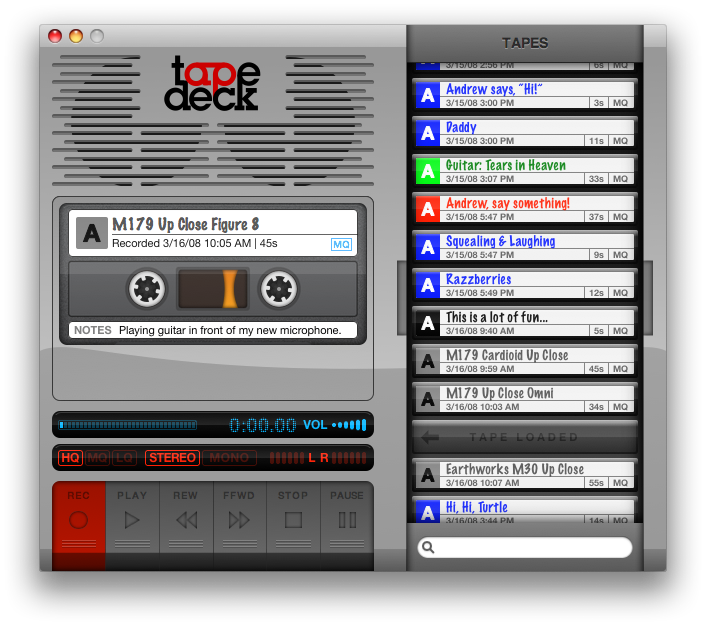 By popular request, TapeDeck now imports from and exports to other audio formats, such as AIFF and MP3. And now, in addition to emailing tapes to friends and family, TapeDeck users can upload their recordings to YouTube with just a few clicks. "We are especially excited about the YouTube uploading feature," says Chris Liscio, SuperMegaUltraGroovy's founder. "Our users can now share their recordings with the world without leaving TapeDeck." 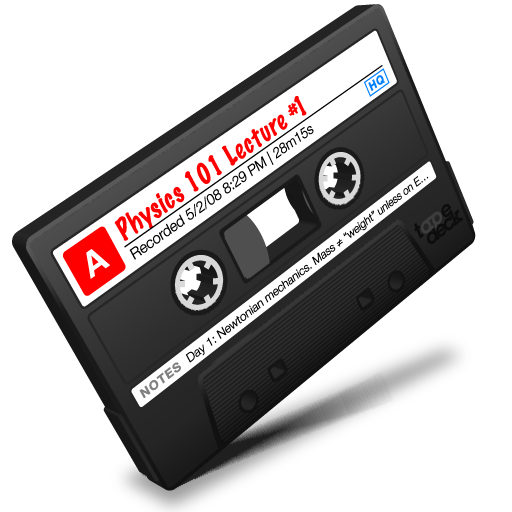 The YouTube version of a TapeDeck tape contains the original audio recording accompanied by an animation of the tape cassette as seen during playback in TapeDeck's user interface. "I've never seen anything like this before on YouTube," Liscio added. The wide range of audio file formats that, thanks to QuickTime, are supported by TapeDeck 1.1 makes sharing tapes across platforms even easier. "Our users made it clear that they wanted to email tapes to their Windows-using friends and family, and we listened," Liscio says. Since its launch, the most surprising source of interest in TapeDeck has been professional users: musicians and engineers who love being able to lay down a track at any time with a single click. That's why TapeDeck 1.1 increases the recording fidelity of its high- and medium-quality presets to a maximum of 320 kbps for HQ recordings. "We have a lot of musicians using TapeDeck to quickly record their ideas, and they want to make sure that if they catch something wonderful on tape, it's captured as faithfully as possible." TapeDeck 1.1 is a free upgrade for registered users, and costs $25 USD for new users and available now. The unregistered version of TapeDeck has a limited recording time, and only records audio in its lowest quality setting. TapeDeck requires Mac OS X 10.5 Leopard, and runs well on any Mac supported by Leopard. Chris Liscio founded SuperMegaUltraGroovy in 1999, writing BeOS audio software during his undergraduate studies at the University of Waterloo. SuperMegaUltraGroovy is best known for FuzzMeasure, the 2006 Apple Design Award runner-up in the Scientific Computing Solution category. Daniel Sandler started releasing software under the toastycode label on the fourth of July, 2006 with the debut of Pyrotheque, his love letter to a misspent youth in a computer lab full of Mac Pluses, ImageWriters, and pixellated fireworks. Apple, QuickTime, Mac OS X, and Leopard are trademarks of Apple Inc. YouTube is a trademark of Google Inc. Windows is a trademark of Microsoft Corporation.